Find hotel near Hold Utcai Vasarcsarnok E .. Located in city center, Hold Utca Food Market is a definite place to visit if you want to experience the amazing local hungarian food. The thing with Budapest is, that the day to day life can only be witnessed with the help of these small time markets which are equally frequented by locals as well as tourists. 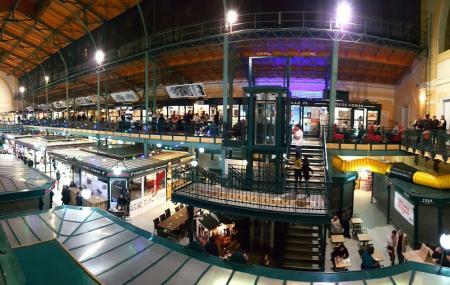 In the beginning of the 20th century, there was a host of markets here which were mainly the hub for food in Budapest. The Hold Utca market was built in between the 19th-20th century and was somewhat modern as compared to the traditional markets. Top notch in quality, a visit to this place is going to keep you coming back for more and experience a lot of other markets of the same city. How popular is Hold Utcai Vasarcsarnok Es Belvarosi Piac? People normally club together István Zelnik Southeast Asian Gold Museum and Andrassy Avenue while planning their visit to Hold Utcai Vasarcsarnok Es Belvarosi Piac. People also prefer to start their day with Hold Utcai Vasarcsarnok Es Belvarosi Piac. Hold Street Market and Downtown market is a great place to eat and buy good groceries. It's really hard to decide where you want to eat, cause there are so many interesting options. The ambience is nice and you can see that there are both locals and tourists hanging out there. I recommend eating here over eating at the Great Market Hall any day of the week. This is a great market. The top floor is food stalls with tables outside of them. The ground floor is some stalls and some restaurants that are semi-open to the room. You can also buy meats and cheeses and other items to go rather than sitting and eating. I ate one lunch at Haxen which was very good. There is also a great coffee place on the ground floor. I went a few times and it was excellent. They even have American style coffee that they call "Hipster Drip". Compared to the famous Big Market Hall, this a much smaller, but nicely renovated and maintained location absolutely in the heart of the city. It is not the easiest to find, because it is not a standalone building. There are really lots of restaurants or snack bars and it is also a popular choice among locals for lunch.